Tuesday night, April 17, 1906, I retired to my room at 807 Geary Street, San Francisco, at the late hour of midnight. I had just written and stamped a letter to a friend in Boston and then tumbled into bed, thinking of my still unfamiliar duties at the store of Shreve & Company. I was soon fast asleep and knew nothing whatsoever until I found myself sitting on the edge of the bed in the early morning light, with staring eyes, a heart that seemed to have ceased to beat and palsied with fear by the horrid, uncanny, weird rocking and swaying of the house. The loose window rattled horribly and while I gazed with staring eyes, the marble slabs bordering the set bowl in the corner were torn from their cement and laid flat across the bowl, the pictures swung out fully two feet from the wall, and the bureau rolled away from the wall three feet or more. All about us thousands of tons of debris were crashing to the earth from lofty spires, heavy copings from six- and seven- story buildings, and only two hundred yards away, the monstrous three hundred foot triple domes of City Hall with their giant columns fell to the pavement followed by almost the entire walls of the structure, leaving the naked steel framework like some great bird cage. And while I listened and watched, a thousand people were done to death within the radius of a mile, and I sitting in my room in the very center of it all, never realizing how nearby death was stalking or how much I had to be thankful for. My most vivid remembrance is the sound of those loose windows. I shall never forget it, especially when I hear one rattle now. I started to walk across the room to the door during those awful forty-seven seconds and found the motion of the house so violent that I had to drop to my hands and knees. I was compelled to stagger from much the same motions as obtained in the jiggling stairs in the Houses of Mirth at Revere Beach, Massachusetts. Everything seemed so unreal, as though chaos had come and the world had ceased to be. And then it stopped, and I thanked God; but all at once it began again, more terrible than before and lasting for twenty more awful seconds. At last it was over, and the house became still, settling back on its foundation, intact apparently, but with every breakable thing within its walls broken to pieces. During all this interval of forty-seven seconds I had not heard a sound from the other thirteen inmates of the house, but on opening my chamber door I found nearly all of them in the hall. In a moment, Mrs. Thompson, my landlady, came up from the floor below and, seeing us all on the landing, looked at us with a quiet smile and said, "Well, boys, that was a pretty stiff one, wasn't it? The front room on my floor was occupied by three boys from Los Angeles. I went into their room to look out into the street. All their pictures were on the floor, and the glass in one of the windows was shattered. The first thing that caught mv eye was the three-story brick house on the next corner, the entire front wall of which had fallen into the street exposing the interior of the whole house. The street was filled with people in all stages of dress who had rushed into the street when their houses began to rock. I looked in the other direction toward Market Street and saw smoke rising even then from several points, though I gave it no heed at the time. It was then about 5:25, the shock having come at exactly 5:18. After talking with the Los Angeles fellows a minute I went into my room and began to dress. I dressed completely, even to the scarf pin, not realizing that the events to follow would make one's personal appearance a matter of small moment. How could I have realized that the fire would follow fast on the heels of the quake and that the handsome new eleven-story Shreve building would be swept by fire from cellar to roof before the sun set that first day? One of the first things I saw was a man limping down the street with an injured foot and clad only in a nightgown. No one seemed to think this unusual. Conventions of polite society are forgotten in conditions like those. Next I noted the efforts of a man to staunch the flow of blood from the leg of a horse who had run away when the quake came. The poor beast was standing in a pool of blood some three feet across. I felt very sorry for the animal but was soon to learn that I should do well to save my sympathy for human beings in worse plights than that of the horse. As I walked down Geary Street and saw the evidences of the quake, I began to sense in a measure the seriousness of it. About five minutes' walk down on my side of the street was a three-story wooden hotel called "The Geary." Adjoining it on each side were two six-story brick buildings. When the shock came, the walls of the upper three stories of both brick buildings fell away together onto the roof of The Geary, which lay between. This immense weight of debris crushed it like an eggshell, carrying the roof and all three floors downward into the cellar. The fourteen people asleep in the building were crushed to death without an instant's warning. Just as I reached the spot, they brought out two bodies and placed them in a furniture wagon. Strange to say, there was a crowd of over one hundred people watching. They passed on after looking for a minute, showing apparently as much interest as a person would in a horse which had fallen down. I cannot explain this apparent callousness, which I myself shared, except by the fact that the people realized instinctively that death and calamity were so generally abroad throughout the whole city individual cases could not claim the same attention and sympathy they otherwise would. At this point on Geary Street, I began to notice the heavier debris which had fallen from the large business blocks. On my left and next to the Saint Francis Hotel was an eight story building with a heavy stone coping. This coping and the upper two stories of the front wall had fallen into the street, and the great stones falling from that height had cut through the cable car rails like so much butter. I then crossed Union Square, facing which stood the Saint Francis Hotel, a modern, steel frame building which showed no sign of injury except for a crack reaching to the second story. This type of construction stood the shock perfectly where the facing of stone was well anchored to the elastic steel frame. It was an awful experience for the guests on the tenth floor, some of them being thrown bodily clear across their rooms, the oscillation being greater at that height, the structure at that point swaying through a greater arc. Arriving at Shreve's corner of Post Street and Grant Avenue, I found the new, eleven-story building apparently uninjured. There was no one around but the watchman and Kelly, one of the shippers. The watchman told me that everything on the second floor of the Art Goods and Clocks was thrown down and broken to pieces. After talking a few minutes I went down to the corner of Third and Market Streets to see what progress the fire was making, and was astounded at the sight that met my eyes. A short distance down Third, at the corner of Mission Street, one large, wooden hotel was entirely consumed by fire, and two other large wooden buildings were a mass of flames, as well as an entire row of two-story tenements running along a narrow alley off Third Street. It was then six o'clock in the morning, only forty-five minutes after the quake. People were dragging out goods from the neighboring buildings, not realizing at that time that the whole city was to go. As I stood in the center of Third Street watching the fire, at my feet lay a man clad only in his underclothes. He was apparently dead, and his face covered with blood. No one paid him the slightest attention, however, and I myself hardly glanced at him a second time. We were interested in watching the progress of the fire, and were greatly amused at the Italians excitedly tying up their possessions in sheets and blankets. We wondered at what hour in the day we might have to go through the same performance. After a few minutes, a laundry wagon drove up, and the man on the ground was placed in it and taken away. I noticed that the floor of the wagon was drenched with blood, mute evidence of the scores of ghastly burdens it had no doubt carried. By nine o'clock it was reported that there were over five hundred injured in Mechanics Pavilion alone, and I had seen the injured carried into the cellar of the Clara Barton Hospital, every room being filled to the utmost. I walked to Union Square with Murphy and Harris, two fellows on my counter who were going to report at the Armory, they being members of the militia. While in this square we had another aftershock, severe but lasting only two or three seconds. It was a curious sight to see two or three thousand people, all actuated by the same awful fear clutching at their hearts, scurry like ants about an anthill to get away from the buildings into the open square. It is utterly impossible to control your fear when everyone else is in the same panic. There is no one to turn to, no one to lean on, and it gives you such a sense of hopelessness as you might feel if you knew that the end of the world had come. However, it was soon over, and we laughed at our fears. From Union Square I walked down Geary to Market Street and up towards Fifth Street to a point abreast of the Mint. All up and down Market, both sidewalks were covered with three and four feet of debris from fallen copings and brick walls. In every instance where the brick face walls had not fallen, they showed zigzag cracks running from the sidewalk clear to the top. At many points the brick and stone reached to the car tracks. The fire had now traveled up Mission Street, which was the next street parallel with Market, to Fifth and was apparently about to envelop the Mint. As I stood on Market Street looking down Fifth, a man asked me for a match. As I gave it to him he remarked that it looked as though the whole city would go up. I agreed with him. I continued up Market to the City Hall and saw there the most colossal ruin you could imagine. Built at a cost of seven million dollars, it was now completely wrecked, the cement walls having fallen away from the steel frame and the huge columns lying in fragments in the street where they had fallen from the series of domes. Strange to say, the bronze statue of Mercury poised on one foot at the extreme top of the upper dome, three hundred feet above the street, did not come down but remained aloft in triumph looking down upon the scene of ruin. Troops from the Presidio, of which there were twenty-seven hundred under command of General Funston, were now being sent into the downtown districts to preserve order. In fact, from then on the city was under martial law. In addition to the twenty-seven hundred regulars, all the militia available were hurried to the city. The fire was now breaking through from Mission to Market at several points near the corner of Fifth, and I realized that if it jumped across Market, Shreve's new building would go, as it was only one block off Market up Grant Avenue. Market Street at this time was a busy scene with the militia regulars wielding their loaded rifles and bayonets, and scores of autos running a mile a minute down the street, carrying army officers and city officials. Every auto in the city was pressed into service carrying officers and messages to and from the Presidio. It was now nine o'clock in the forenoon, and I went back to the store. About twenty-five men had assembled, and under the direction of Kelly we began to pack the silver away in an extra vault in the basement. While half the men hastily rolled the silver up in tissue and placed it in trays and wastebaskets, the rest of us formed a line and carried the trays down to two men who packed the vault full from floor to ceiling. The only light we had was a broken lantern. Fearing that would tip over, and needing more light, it occurred to me to get a lot of candles from the candelabra stock and use those in the basement. If they fell over no harm could be done. As I made trip after trip into the dark cellar, I could not help but think of the possibility of another shock attacking the already weakened structure and precipitating the weight of eleven floors down upon us. However, no such thing occurred and by eleven o'clock we had all of the silver, both hollow and flatware, packed safely away in the steel vault. Of course, the night before all the diamonds, gold jewelry and watches had been packed as usual in the splendid steel room on the street floor, a room absolutely fireproof and twelve by nine feet in size. When these two vaults were opened three weeks later, the contents were found to be uninjured with the exception of some silver near the door in the lower vault. While packing the goods, we could see in the mirrors and the wall cases the reflection of flames in an eight-story department store on Market Street, just one hundred yards away. Every floor of this building was burning fiercely, and every window was a square of vivid red and yellow. I began to wonder if my house was still standing and resolved to pack my things as soon as I could leave the store. Mr. Koch of the Repair Counter had not arrived, and Murphy and Smith had gone to report for militia duty, so there was no one looking out for the Repair Counter. The night before, the valuable repairs had been locked in the vault, but there were hundreds of less expensive ones such as five- and ten-dollar rings and ordinary gold jewelry repairs without precious stones for which all sorts of claims, just and otherwise, would be brought should they be destroyed. I therefore suggested to Mr. Bonney that we store these away in the vault, and he heartily agreed. The only receptacles I could find were wastebaskets, and these I filled, covering the tops with paper, tying them down and designating the contents of each basket by the letters of the alphabet. I had reached drawer "S" when Mr. Koch arrived and commended my forethought. Together we packed up everything connected with the Repair Counter: scales, repair tickets for work done and future work, and so forth. Finally, everything possible being packed away and a sergeant and four soldiers having come to guard the store, we were dismissed. I immediately went home to see how near the fire was to my house at 807 Geary Street. From all appearances it would take us from the rear, coming up Larkin Street, which crossed Geary Street at right angles. It was then seven streets away and apparently travelling at the rate of about a block an hour. Mr. Thompson and I went down to the foot of Larkin at Golden Gate Avenue and then through to Market by the Hibernia Bank. The conflagration had reached Ninth Street in its course up Market and Mission. That side of Market next to Mission presented a grand and awful spectacle. To see the huge Palace Hotel with its thousand rooms, the twenty-story Call Building, the Emporium---a store the size of Siegels- -- and the great Hale's Department Store, all burning at once, as well as smaller buildings in between, was certainly a wondrous sight. The streets were packed with people, and every sort of vehicle had been brought into use to carry away articles of value. After watching things for awhile we went back to the house. It was then one o'clock and I began to pack up my effects for I realized that Frisco was doomed. 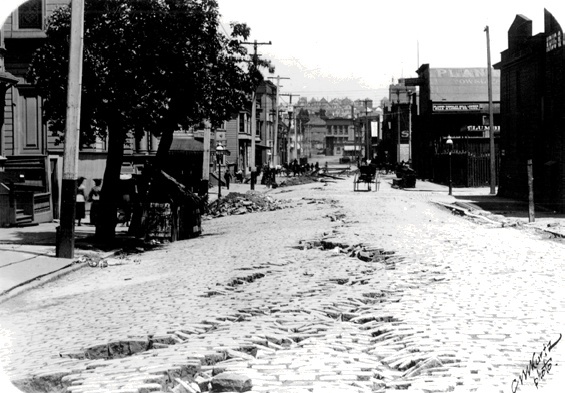 1906 quake damage in the Mission District; this is probably an eastward view on 18th near Shotwell. As I worked in my room I could look in the large glass on my bureau and see the leaping red and yellow flames mounting a hundred feet in the air. Looking over the housetops to the flames gave the impression of nearness to such an extent that it seemed as though they would be upon you in a few minutes. After filling my suitcase I made a large, square bundle of clothes in two thicknesses of newspaper, having no stronger paper at hand. I had not been in the city long enough to collect any quantity of things in my room so had nothing to carry but clothing. I left nothing but my razor strop, and I overlooked that as it hung behind the door. Each of the lodgers rolled up the blankets on his bed. We knew we would have to sleep out of doors if we slept at all. Having gotten everything ready for a hurried departure, Mr. Thompson and I went out to report the progress of the flames. This account by Arthur C. Poore first appeared in the Spring, 1990 issue of The Argonaut, a journal of the San Francisco Historical Society. According to research conducted by Dr. Robert J. Chandler, history officer at Wells Fargo Bank, Arthur C. Poore appears to have been a recent arrival to San Francisco at the time of the 1906 disaster. A lengthy account recorded in 1959 of the experience of the 1906 earthquake and fire, as told by Katherine Ivancovich Sullivan. Go to this link and click on the button "Audiovisual--Kate Earthquake"